Standing at attention was losing her interest quickly now, her anxiety making it difficult to not fidget, but there were too many eyes in the throne room of Stormwind Keep to risk drawing attention to herself. Still, she itched to get this whole ordeal over with. Patience, the Voices hissed seductively. Soon, your chance will come. Sssoon. Aerora straightened, reminding herself not to reply to the Voices aloud. That would only give her away, and she had come too far now for that. Instead, she shifted ever so slightly from one foot to the other and adjusted her glowing violet shield against her arm. The diplomatic formalities played out before her, and she silently thanked the Light she was not expected to participate in them. She unconsciously winced at that thought and flexed her sword hand. For centuries the all-encompassing, warm glow of the Light had been her constant companion. Now… she felt nothing. Not even a hole, but a void of growing darkness. It would not be much longer before that darkness consumed her, she knew. The Voices had taken most of her thoughts and made them their own, to feed back to her piecemeal at their discretion. Somehow, they still managed to maintain a facade of Light around her, making her detraction less obvious and being the only reason she was able to get as close to her intended target as she stood now. Her armor gleamed in polished purple, her axe and shield complementing their shades, and the faux-Light making her gleam as the other emissaries did. Aerora silently studied him, forcing herself to mask the disgust rising in her throat like bile. Her sword hand itched with a need to remove that pompous smirk from the human King’s smug face. 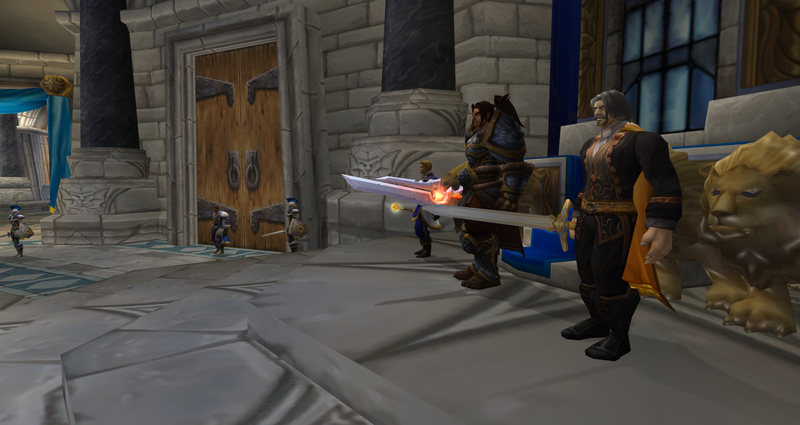 Varian Wrynn listened and nodded on occasion during this meeting with the ambassadors of the Draenei race. King Genn Greymane maintained a presence beside the King, but wisely a silent one. Prince Anduin had been spending much of his time with the Prophet Velen of late, learning the ways of the Priest, and now there was talk of a closer alliance between the two races. The mostly aloof Draenei had been working to solidify their ties by further proving their commitment to the Alliance, and Anduin had been vital in every one of those talks thus far. He was proving to be quite the diplomat, beloved by all the people, and very unlike his grim and stoic father. So close her masters had been to this boy who would be King! Arch Bishop Benedictus had made several attempts to bring the Prince beneath his wing and teach him, but not the ways of the Light. Then, Velen had swept in and whisked away the Prince not only from Benedictus, but Stormwind entirely. In fact, it had been through the Arch Bishop, mentor to the Draenei emissary Aerora, that the young Paladin had been introduced to the Voices. The Voices of the Old Gods. A cajoling and maddening presence all at once. At first, they merely coaxed her with ideas of improving her place in the Draenei ranks. Then, they switched to murderous thoughts of overthrowing Velen himself. In fact, her first assignment had been to assassinate the Prophet, but true to his name he seemed to sense her intentions, and made himself conveniently unavailable to her in all her attempts. She had not been before Velen since the Voices had begun to visit her. Finally, the Voices switched their focus, especially after the failure and fall of the Arch Bishop. King Varian Wrynn was a much more unwitting target. It was as the Draenei moved forward and knelt before the King of Stormwind that Aerora felt the Voices’ presence became more animated. They began to whisper incoherently in a cacophony of hisses and sharp syllables. It took every ounce of Aerora’s presence of mind to keep from clapping her hands over her ears and screaming. Now! Now! NOW! the Voices suddenly screamed. In a single fluid motion, Aerora’s axe was off her belt and whistling toward the head of the King of Stormwind, a war cry bursting from her lips unbidden. Instead of the soft bite of flesh, her axe met a shield of golden Light. Rage flaring in her eyes, Aerora’s gaze fell upon Prince Anduin. He met her eyes with his own without fear, his fingers already shaping another spell. With abandon, the fallen Paladin charged at the Prince of Stormwind, once more raising her axe, desperate to interrupt his cast before whatever force he sought to unleash could hit her. Arms were grasping at her from every direction and King Wrynn was nowhere in sight. The interceders broke her stride just long enough for Anduin to finish his cast and Aerora screamed in agony as the force of his Light attack struck her, like a lightning bolt formed of fire. Waves of burning pain accosted her but, as her adrenaline kicked in, she was able to break free of those holding her and cast a sphere of protection over herself. With that in place, Aerora fled Stormwind Keep, wounded and fearing the retaliation of the Voices that was sure to follow. As she stumbled off, she noticed the color had bled from weapons and armor, leaving them a lifeless black. There was no going back now. This story was originally published on Effraeti’s RP, on April 21, 2012. All rights reserved.